Sometimes having on you a simple flashlight isn’t enough as you want to be prepared for the darkest of nights. You don’t just need a rugged, lightweight or durable flashlight, you need one that lights up your way and has a great range cover. If the material of the body tells you about the durability of the flashlight, you need to check the overall light output measurement of lumens to get an idea on the brightness of your tool. The angle and size of the reflector count a lot for the beam distance and the peak beam intensity. Lumens tell you about the overall light output, but this doesn’t tell you much about how far is the light going to travel. So you do need to know if you want the light to travel far or want a flashlight that is very bright, but doesn’t have the greatest throw. Keep in mind that there’s always the chance to end up with a flashlight that is simply too bright for your needs. Most of the flashlights out there nowadays use LED emitters as light sources. They are way brighter than the old incandescent lights and withstand longer use. You may also find HID lights (High Intensity Discharge), but they are typically higher priced and, therefore, not very popular. A bright flashlight typically starts from 1000 Lumens and its first-rate beam shouldn’t be lower than 1,640ft. Try to get a flashlights that uses Li-Io batteries and have a wide light beam. Just because you want to use the brightest mode, doesn’t mean you should get a flashlight that has only one light mode. Get one that has several brightness modes. As for the body, you want your bright flashlight not to get too hot when in use and to be also impact and water resistant. With this in mind, don’t settle for anything less than reliable performance and durability. the choices are so many and it shouldn’t take you very long to decide. 1. Compact and so easy to use, the Prosvet E6 1200 Lumen Cree-XML T6 led Portable Zoomable Flashlight impresses with its brightness, despite its low price and small size. The flashlight uses Cree T6 LED lights that has a long lifespan, up to 100,000 hours. It gives you five light modes to choose from and it’s very easy to go from one mode to another. You get to use accordingly to your needs: high/middle/low/strobe or SOS mode. It’s easy to use the flashlight and the deep press tail cap on/off switch is responsive and helps using this compactly shaped flashlight. The focus is adjustable and it’s very easy to set the various adjustments. The body is made with high quality 6061T aluminum alloy, taking some splashes as it’s water resistant (not waterproof, though). You need to use three AAA batteries or one 18650 battery. It’s easy to change the batteries when in need. Lightweight and with a solid build, the flashlight is easy to carry (it has a lanyard) and to store. It’s well-made and has a good grip. Despite the minor cons, when you take a look at the price and the performance you get, you realize you got yourself a great deal. 2. Small and bright, the LuxPower Tactical V1000 LED Flashlight [2 PACK] put a dark trail under a bright light, which should be enough for the price you pay. Fortunately, the flashlight brings more to the table which explains its popularity. With the LED light source, this is an amazingly bright 1000 lumen flashlight, with 5 operating modes to choose from: high, medium, low, strobe and SOS mode. The adjustable focus is efficient and you may confidently rely on the large area floodlight or the nicely focused spotlight. The built of the flashlight is another thing to mention. 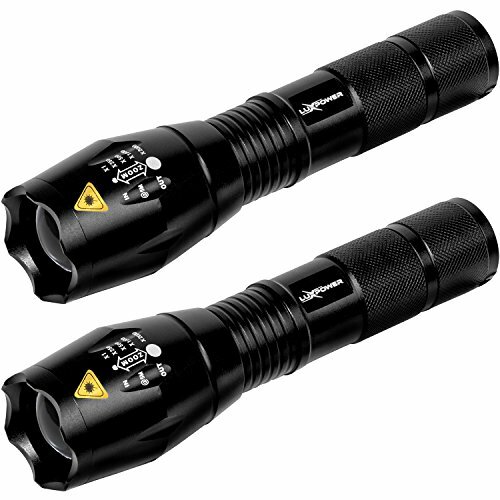 Tough, made with durable aluminum, the flashlight is weather, water and shock resistant. You can use it in a pouring rain and drop it – the flashlight takes a splash and a fall for sure. You may even submerse it under water for a short time. The compact shape of the flashlight makes it very easy to hold and to store no matter if you go dog walking or hiking for several days. It runs on three AAA batteries, but you may also do your job with one rechargeable 18650 battery. The flashlight feels good in your hand and is very easy to use. Its anti-roll body ensures a sturdy grip and you may also use the fronts strike bezel in emergencies. It also presents a Smart Power Management that lets you use it continuously for hours. It’s long lasting, bright and has a powerful beam. You get 2 flashlights for one prices and several accessories for easier use. Regardless, we still think this is a great deal since you get two bright, durable, tough and small flashlights for the price of one. 3. Easy to fit in any pocket as it’s small and has an ergonomic shape, the Rechargeable LED Searchlight Tactical Flashlight CREE T6 Spotlight 2400 Lumens IP65 Waterproof Handheld Floodlight is definitely an option to keep in mind whenever you go shopping for an AAA flashlight. The flashlight gives bright light as it comes with 350 Lumens Cree XPE LED bulbs and has a good throw. You may benefit from its versatility and use the white flashlight with all of its four modes (high/medium/strobe and SOS), the white emergency light (that also has three light modes: high/medium/low) and the red indicator light (also offering three operating options). The focus is adjustable which means you may get a good spotlight for longer range observation and take advantage od the floodlight when you want more light on a larger surface. The adjustments are easy to make, by rotating for dimming the focus. The flashlight uses one 18650 Li-Io rechargeable battery or AAA battery. The wall charger and the battery holder is functional and the flashlight runs for a specific amount of time for each light modes. The body of the flashlight is made with AirCraft Aluminum Alloy which gives you a durable and dependable flashlight. 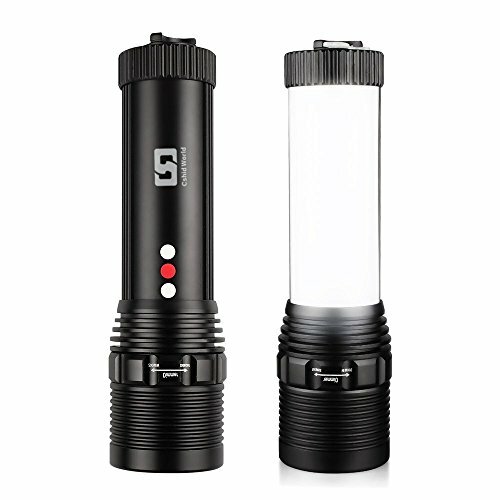 the flashlights has a dust water resistance design and you may use it on a rainy day. The concentrated convex mirror matches the durability of the body. We like the tough build of the flashlight and its nice size. The light is bright and this flashlight comes at a fair price. Nevertheless, for the money you pay, the flashlight still stands as a reliable and bright option. It’s a good choice for your tactical needs. 4. 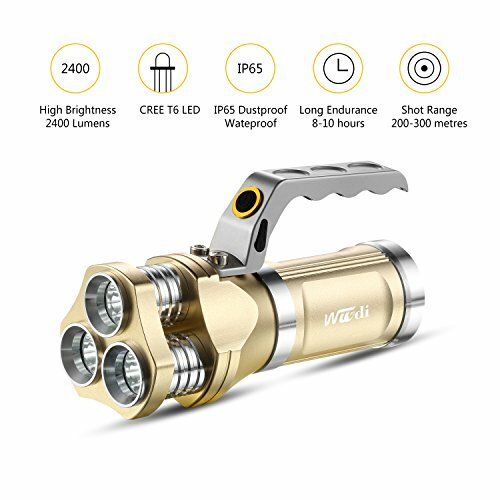 You only need to take a quick look at the Rechargeable Flashlight Wuudi CREE LED Hunting Torch Tactical Flashlight Portable Lamp to realize the flashlight is a far cry from other plastic options out there. The flashlight gives a maximum output of 2400 Lumens and comes with Cree LEDs that have an impressive life span (up to 100,000 hours). Depending on the situation, you get to set one of the three light modes: strong/weak or strobe. It’s easy to use the flashlight and to switch between modes as well. It’s not only the brightness that makes a nice impression, but also the throw of the flashlight as the beam has a wide range that goes up to 980 inches. 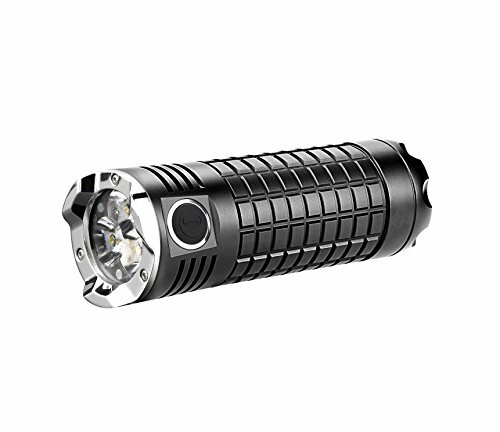 The aluminum alloy body gives you a tough, yet lightweight flashlight that you may take in so many outdoot situations. The handle is comfortable, has a good grip and makes the carry easy and secure. Some used the flashlight even on a rainy day and noticed the joints hold up pretty good the splashes. Play it safe though and avoid submersing it. The flashlight is well-made and so easy to carry around. It comes with various items for more efficient use: one battery holder and a dedicated USB cable. We definitely like a lot not only the design, but also the cool looks of the flashlight that manages to combine looks and use at the same time. For all the good things that offers, we’re not stepping back from choosing it when in need. 5. 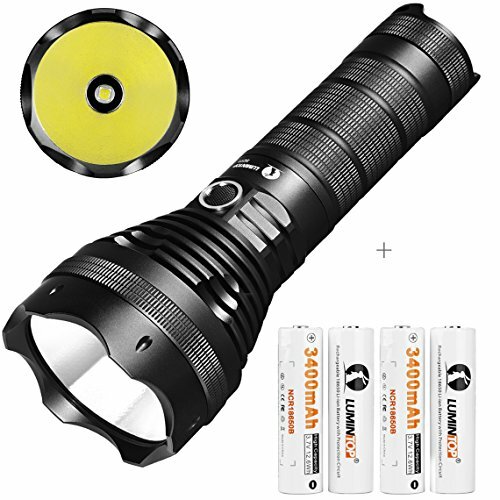 Easy to carry around and surprisingly small for the bright light it gives, Onedayshop Super Bright 7000lm 4cree Xm-l T6 LED Flashlight Spotlight Searchlight Torch Aluminum Alloy Flashlight is what you’d call a reliable, bright flashlight for all sorts of situations. Using 4 Cree XM-L LEDs, the flashlight has an amazing output of 7000 Lumens which means it lights up your way in the darkest night. Farthermore, the flashlight helps you set the just the right amount of light output in a specific situation with its various light modes: low/mid/high and strobe. The flashlight has a nice throw and the light travels up to 3280ft. The high light output comes in a aluminum alloy body that not only takes the heavy use, but also doesn’t heat up when used. The coated glass lens is also durable, giving a nice light and taking a drop. The tail-cap switch makes the flashlight easy to operate and increases the compact profile of the flashlight. The risk for accidental operating is minor. You need four 18650 Batteries to operate the flashlight and a lot of patience for them tu fully charge (even 8 hours). The portability of the flashlight adds on the list of good things, increasing its portability. In a nutshell, the flashlight is small, yet so bright and ready to take the challenging jobs. We’re not stumbling into the minor unfortunate issues and we’re ready to put our money on stake with the flashlight any given day. 6. Talking about the Streamlight 88060 Pro Tac HL 4 2,200 Lumen Professional Tactical Flashlight isn’t easy as it’s a challenge to resume it at just a few words. 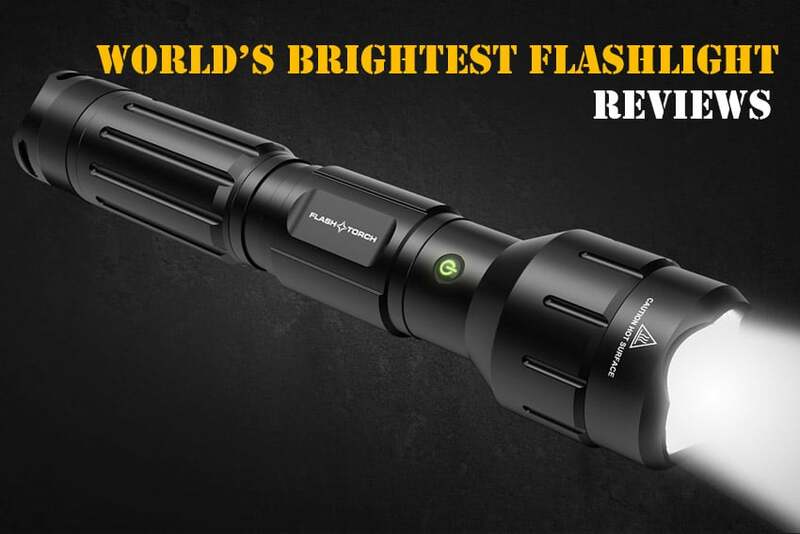 This flashlight doesn’t just gives you amazing bright light, but also presents a tough build which definitely recommends it for the tactical jobs out there. Emitting a maximum light output of 2,200 Lumens, the flashlight is a reliable tool when you’re out in the field. The LED technology gives it bright light, whereas the 3 volt rechargeable CR123A batteries keep the flashlight running for a long time. The beam is nice and concentrated thanks to the engineering in the build and the peripheral illumination doesn’t disappoint either.The battery has a good life span and the LED solid state power regulation provides better light output for the battery. We also take notice on the flashlight’s versatility as it features a self-adjusting battery cradle that allows you to use differently sized batteries. The risk for rattling in this case is minimal. The flashlight gives us many reasons for liking it and the Ten-Tap programmable switch is one of them. You may actually choose one of the three various programs so you have just the right amount of light every single time. Remember the part about the tactical jobs? Well, the flashlight has a heavy-duty build which makes it tough enough to go through high and hell water for you. The flashlight handles a drop and gives a safe grip. You may take it underwater up to 1 meter, for 30 minutes as it has an IPX-7 waterproof degree. On top of everything else, you may attach the flashlight to your weapon as it’s rugged and build not to disappoint you when out on the field. For all the good things it brings to the table, it goes without saying that we wouldn’t say “no” to this one when put into a position of choosing. This is a great CR123 rechargeable flashlight. 7. Compact and fairly easy to use, the Olight SRMINI-II Intimidator II 3200 Lumens 3 x Cree XM-L2 LED comes with so many good things, that we wouldn’t know what to start with. The flashlight has many features that helps it keep up the pace with the new technology. For better understanding, scroll down for a more detailed description. Powered by three 18650 batteries and using three Cree XM-L2 LEDs, the flashlight has a wide beam and an impressive max output of 3200 Lumens. It offers you three brightness levels, whereas the Turbo and Strobe mode are reliable for the most challenging emergencies. Everything about the flashlight tells you about a solid, tough little flashlight that really delivers when in need. The light comes with a rugged and thick stainless steel bezel, increasing the flashlight’s durability. This is why many from law enforcement or dedicated outdoors hobbyists choose to use it a lot. This makes a great law enforcement flashlight. The flashlight features acrylic lens with a honeycomb-like streak line surface which explains the nice, even beam. The list of smart features continues with the Quick Turbo mode operation even when the light is on, the Micro-USB charging port and the switch locking/unlocking function. The flat tail cap design sustains its compact shape, whereas the lanyard hole increases its portability. Furthermore, the flashlight is able to stand by itself, which makes it more versatile. The LED charging power indicator lets you know when the battery is wearing out and the multi-function side switch makes use a breeze. The body is made with Type-III hard anodizing aluminum sustains the performances of the flashlight that handles a few drops and splashes. Impressivelly bright, the flashlight is a nice tool for your tactical gear and doesn’t disappoint. The downsides aren’t deal breakers for us and we’re sure about one thing: the Olight does deliver and doesn’t disappoint in the darkest night. 8. What really got us on the LUMINTOP® SD75 4000 Lumen Rechargeable Searchlight LED Flashlight is its versatility that makes it a great choice for self-defense emergencies and wild life watching at night just as well. No matter why you use it, the flashlight is bright enough to scare your attacker away so you need to pay attention to how you point it out. The maximum output of the flashlight is 4000 Lumens and the throw is also amazing: up to 2,139 ft. It uses XHP70 LED which explains the high performances. Don’t think the flashlight has only one mode, as in fact it has 4: low, mid, high and strobe. A deep precision OP reflector gives a nice, wide beam that has an impressive cover range. Another thing we really like on the flashlight is the fact you may recharge it in the light inside your car, but you may definitely use the wall charger when you’re at home. A battery indicator keeps you to date with the battery level. The body of the flashlight is worth to mention as it’s made with high strength aerospace aluminum and presents anti-scratching HAIII hard-anodized finish. This means the flashlight is tough and ready for the heavy-duty jobs. The workmanship is also impressive, ensuring the high-quality of the flashlight. 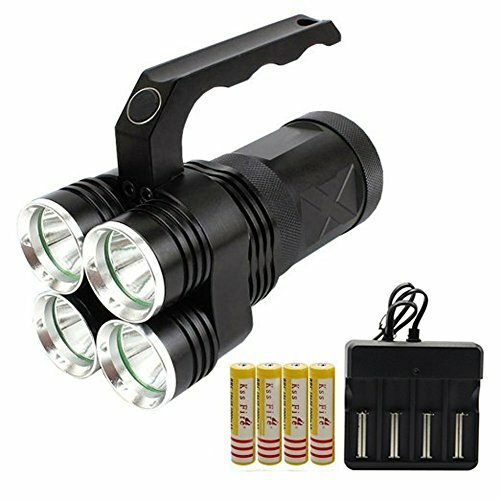 You need four 18650 batteries for operating the flashlight. Small and ready to bring some light when sailing your boat also, the flashlight is one heavy-duty option that you shouldn’t miss. For the bright light and rugged build, we’d always put this one in our shopping cart as it’s a sure buy. 9. The more you’re willing to pay for your flashlight, the more you get and the FENIX TK75 4000 Lumen 2015 Edition Quad CREE XM-L2 U2 LED Flashlight is one bright flashlight, to say the least. The flashlight has a 4,000 Lumens maximum output and may run for 11 days in a row. The flood beam angle is more than 80 degree which means you can see far and beyond when checking your property in the middle of the night. The beam reaches far, up to more than 2,100 feet. You may easily set the right light mode switching in between the four brightness levels. The 2 momentary-on modes increase your options, whereas the lockout design minimizes risk for accidental operation of the flashlight. The brightness is constant thanks to the digitally regulated output and the reverse polarity protection protects in case you installed wrong the batteries. It’s also easy to use the flashlight and the dual button switch system is placed in front and easy to press. The aircraft-grade aluminum body is protected by a Premium Type III hard-anodized anti-abrasive finish. The flashlight isn’t just tough, but also long lasting, handling a beat. The ultra-clear glass lens with anti-reflective coating is strong, completing the rugged build. The flashlight needs four 18650 rechargeable Li-Io batteries, but you may also get some help from eight CR123a batteries when in need. The list of features also includes a power display of runtime and a back support system, which is comfortable for your. The Port Smart Battery charger is automatic and compatible with many types of rechargeable batteries. Additionally, it also automatically identifies the rechargeable batteries (Li-Io, Ni-MH and Ni-Cd), providing the right charging mode afterwards. We bearely take notice of the downsides though and we only focus on the multiple great things: the bright light, the tough build and the amazing throw. 10. Heavy lays the crown on the brightest flashlight out there, which is why we play it on the safe side and see the Nitecore Tiny Monster TM28 6000 Lumens 716 Yards Super Bright Rechargeable LED Flashlight one of the brightest choices out there. The flashlight has an incredible 6000Lumens maximum output as it features four Cree XHP35 HI Leds. The light reaches far, up to 2,1408 ft. This makes a reliable choice for the search and rescue missions. There are very good reasons for calling the flashlight “the Tiny Monster”: the amazing brightness comes in fact in a very small package that feels nice in any hand and it’s so easy to hold. Additionally, the body is made with aero-grade aluminum which explains the durability and ability to take the challenging jobs. Its IPX8 waterproof grade lets you submerse it and confidently use it in the pouring rain. The flashlight is made to last and to perform in extreme temperatures, high or low just as well. The single button user interface explains the ease of use, even one-handed. The versatility of the flashlight doesn’t disappoint either and you may always use one of the five brightness settings, just the way you need. It’s easy to go from one mode to another and you get to set the flashlight on one of the following: daily &search mode, strobe/SOS/beacon. We’re not forgetting the tripod mount that transforms the flashlight into a stationary light nice and easy. We’re also thrilled with the included AC adapter and the smart charging circuit that selects the right charging mode, according to the battery type you’re using at that moment. The flashlight comes with many features like the built-in Oled display that keeps you updated to the brightness level, remaining runtime, battery level, and so many other useful information. As for the portability, no worries either. The flashlight comes with lanyard, holster and spare o-ring so it’s very easy to carry it around and to protect it. Fitting perfectly in your hand, the little monster is one choice to always have in mind when going shopping. All things considered, for the amazing brightness level, the rugged build and all the other great features that come along, don’t hesitate and make a wise investment.